The party held a unity rally Thursday evening in Peachtree Corners. ATLANTA — After a long and contentious fight, Georgia Republicans say they are ready to unite behind candidate Brian Kemp for Governor. 11Alive's Ryan Kruger was at the event, which brought in all the heavy hitters for this event. Everyone from Gov. Nathan Deal to our state’s two Republican senators, David Perdue and Johnny Isakson. Even Casey Cagle, who once said Brian Kemp couldn’t win in November, changed his tune and supported Kemp with the shake of a hand. Despite the long primary, Republicans were all on the same message: They plan to define Kemp’s opponent, Democrat Stacey Abrams as an out-of-touch liberal. 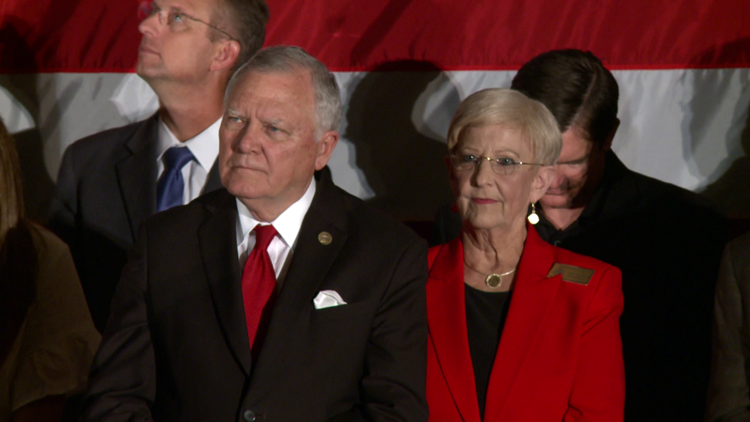 “(She's) the most liberal candidate that has ever been put up for governor of Georgia,” said House Speaker David Ralston. “She is looking to put her radical, left-wing agenda first," added Kemp. Abrams is the first unapologetically liberal candidate seen run for governor, but on the other hand, Brian Kemp is one of the most conservative candidates seen, at least as far as his rhetoric goes. 11Alive asked him if any of that would change in the fall.